These fifty-six ‘distressed sonnets’, as Semmens calls them, are constructed from the language of the poet’s ancestors, their letters and diaries, and from the FBI files, news reports and book extracts from the times they lived in. 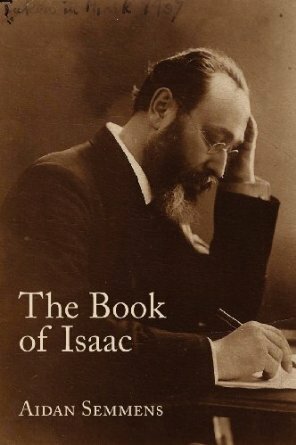 The poems form a narrative centreing around the life of Isaac Hourwich, Semmens' great-grandfather, a Russian Jew, who emigrated to America, an "economist, lawyer, journalist and socialist". Chopped and blended sentences are run together, giving the reader a sense of what's happening, but a skewed sense, and a fruitfully disorienting one; reading this book is like listening to overheard conversations, or sneaking a reading in a personal journal; as readers, we are immersed in the life of these long-dead people, thinking their thoughts and sharing their hopes and anxieties; no superior narrator condescends to them; they speak for themselves, or rather, as we read, we speak with them. "My grandmother was nine years old when her mother and aunt were arrested in the night and sent to Siberia. It was several years before she saw either of them again." still warm marked lack of Manya from the bed..."
"police came and mother left"
The poems tell us of workshops in East London and old Manhattan, sea voyages, dark sweatshops, and "a small house a little cottage" in England; they evoke the people's life-experiences, and allow us to share their mental processes. The scope of these poems is epic - from European Russia to Siberia, London and New York, from the Tsarist era to the revolution and the trade union struggles of the New World. The poems collage phrases from the Talmud and from Lenin, with snatches of vernacular, news reports and other found language. The collagist technique is not new, of course; but is effective here because the choice of source materials and the fact that they encapsulate a narrative on a grand scale, from the very personal and poignant, to the cosmic, via quotations from the apocryphal Book of Esdras and other religious texts, though it should be said that one of Semmens' stated aims is to "continue and honour the post-theistic Jewish tradition" of his forebears. There are notes at the end of the book; one for most of the sonnets, and they form a counterpoint and relief to the disjunctive texts themselves. It would have been nice to have had a more exhaustive set of references in order to give the reader an appreciation of which sources had been used; maybe the publisher could have provided an online resource to this effect. of life, dreams float in air, shtetl visions of Chagall. I'd like to hear these poems read out loud; Semmens' musical ear constructs a fitting tribute to his Jewish ancestors, to their courage, idealism and humanity. Copyright © Alan Baker, 2014.